Weigh In: I gained 15.8 pounds for an adjusted total weight loss of 48 pounds. I lost 13 pounds last week with the stomach virus and knew some of it would come back but I didn't know I would gain that much. I know it is my body adjusting to what I went through with the stomach virus but seeing a weight gain like that is still pretty shocking and disappointing. Nutrition: So I have to admit that it hasn't been a great eating week. I finally got my appetite back and started eating things I craved like fast food. I didn't make healthy choices and even had an iced coffee several times this week. I also went out to eat on Sunday on another date night with the husband. Time to get back on track with the Skinny Jane 10 Day Challenge! Exercise: Monday and Tuesday I was still recuperating. The rest of the week I walked tons. 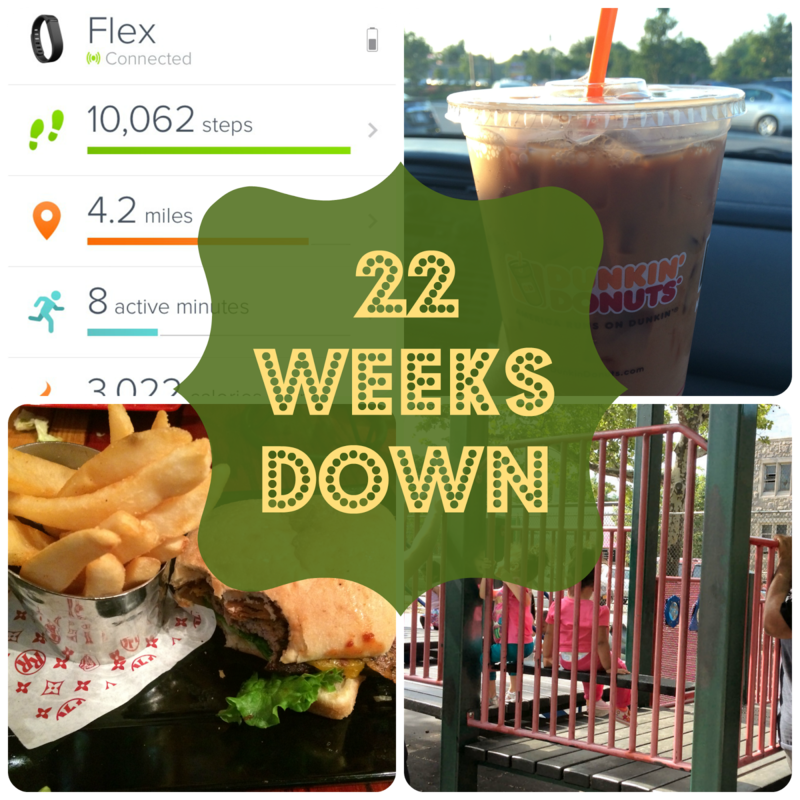 I hit my goal Wednesday through Sunday. Though I am enjoying the weather and walks I really need to get into the gym for a tougher workout. It is only a matter of time before my body adjusts to the walking and it will not be enough. We experience a few bumps on our weight loss journeys. Feel better soon, Michelle. After that, I'm sure you'll be back in your groove. Don't give up, my darling. Being unwell is not disappointing, it is a bump in the road. Now that you are getting well again from the virus, you can achieve your goals with more strength. How long do you usually stay in the gym for a day? Do you take multiple rests? I appreciate how honest you are. You are doing great and little set backs happen. You will get that momentum back! I struggled too after I was sick. I am confident that your strength will return to your mind and body. Go out and get it done! I think balance is always important- you had some cheat days, but getting back on track! Writing about your goals is a great way to hold yourself accountable. Keep it up! Wow, that's a huge roller-coaster ride due to a sickness. I've lost 5-6 when sick, but never that much! Little by little, it is good to remember that this is definitely a journey - thanks for the reminder! It is so hard to lose the weight.. i hate going to the gym, but i force myself to get there as much as i can, but really it is not enough! keep it up! Losing weight can be so hard, but over all you have been doing good. Don't get discouraged. Overall you have been doing an amazing job. Don't let one week get you down! Dieting is never easy, you're bound to hit a couple of bumps in the road. Keep up the hard work and you'll see results. Wow! THat was a lot of weight to lose from the stomach flu. Bummer you gained so much of it back plus some. No! When I started eating junk after my hard work, I knew it was over. I kept making excuses for myself! You have done so well! I hope you keep going! This week has been bumpy for me. Eating out way too much and drinking to much pop. Thanks for sharing your journey. Aww girl I know dieting is hard but try dieting by medical order while pregnant no sugar no fatties no yummies. Currently so depressed by the lack of sugar. The pounds lost while you are ill will always come back sooner or later hate the yo-yo effect. I hope the drastic shift on your weight doesn't affect your system but looks like you are managing it well. You cannot and do not be disappointed with your progress. Weight gain is normal so there's no reason to be disappointed. I have had numerous bumps in the road on my weightloss journey. It will be okay and you will get the other weight off. I hope that you are getting to feeling better. Don't worry you have been making great progress and still will. Keep up the great work. I'm glad to hear that you are feeling well no. I'm sure you will lose those gained pounds in no time. Good luck! I really love your journey on your weight loss, your story right now is a bit of sad, but don't be discourage and keep a heads up and find your resolve so you could get back on the track. Good luck on meeting your goals. How long is your average gym visit? It is great you are being honest with yourself and your readers about these mishaps. It puts more trust in you because everyone needs to know there is a human being doing this and humans mess up. But what I love about your posts is you get right back on track! You are doing great! You are so incredibly brave by telling your story in an honest way. making yourself accountable for your set backs only helps you go further in life and goals. it gives you the chance to think and go at it again with a new perspective. You're doing awesome! Keep up the good work. You are doing great! And you DON't need to feel bad about Iced Coffees. Just get them without sugar. OR add one packet of sugar yourself ( One packet of sugar is only 13 calories). Turn Your Photos into a Fun Puzzle with Piczzle! Healthy Peanut Butter Banana "Ice Cream"
20 Weeks Down and 50 pounds Gone! Natures Best Vitamin C Serum Review! Dapper Snappers Toddler Belt Review and Giveaway!